G. Reed, Introduction. K.L. Parkin, General Characteristics of Enzymes. K.L. Parkin, Environmental Effects in Enzyme Activity. J Wegstein, Modern Methods of Enzyme Expression and Design. P. Aldercreutz, Immobilization. R. Bigelis, Carbohydrates. J. Adler-Nissen, Proteases. S.E. Godtfredsen, Lipases and Esterases. F. Hammer, Oxidoreductoses. T. Szakucki, Application of Oxidoreductases. B. Sproessler, Milling and Baking. R.E. Hebeda, Starches, Sugars, And Syrup. R.J. Brown, Dairy Products. W. Pilmik, Pectic Enzymes in Fruit and Vegetable Juice Manufacture. T. Nagodawithana, Flavor Enhancers. J.-C. Villettaz, Wine. J. Power, Beer. D. Bernnachi, Enzymes for Meat Tenderization. G. Stafansson, Fish Processing. In the past 35 years, the use of commercial enzymes has grown from an insignificant role in the food industry to an important aspect of food processing. This Third Edition of Enzymes in Food Processing explores recent and extensive changes in the use of enzymes as well as the discovery of new enzymes and their uses. 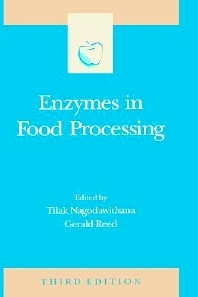 Included in the book is a history of the role of enzymes in food processing, enzyme characterization, a discussion of different classes of enzymes including lipases and proteases, commercial enzyme production, and the processing of particular foods such as meat, vegetables, fruit, baked goods, milk products, and beer. Unlike earlier editions, it provides basic information on enzymes and their uses not adequately described in the current literature. Food technologists will find in this edition a description of the properties of those enzymes that are important in food processing, as well as a description of the properties of those enzymes that are important in food processing, as well as a description of the many applications of enzymes in the foods processing industry. The book is intended for food technologists, and will be of value to the microbiologist and enzyme chemist as well. This treatise provides a comprehensive treatment of enzymes used in food processing.